The Talent Search program is part of the campus's commitment to support lower-income students in their aspirations to join the University of California. 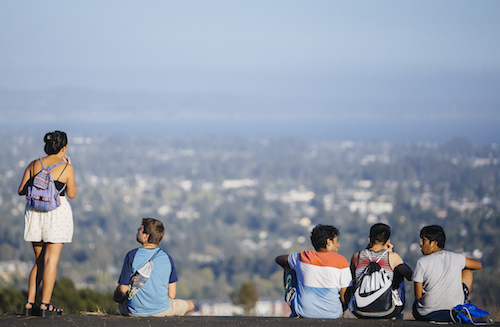 UC Santa Cruz’s Educational Partnership Center has been awarded a $1.2 million federal grant over a five-year period to assist disadvantaged middle and high school students in Santa Clara County in pursuing a postsecondary education. The U.S. Department of Education received 880 applications and awarded 459 Talent Search grants, providing $144 million in funding that will help more than 300,000 youth across 49 states, Puerto Rico, Guam, the Federated States of Micronesia, and Palau in gaining the skills needed to successfully graduate high school and prepare for college. Talent Search, one of eight programs collectively known as the Federal TRIO Programs, connects disadvantaged youth and their families to high-quality tutoring services and counseling services to improve financial aid literacy and financial planning for postsecondary education. “The Talent Search program is part of our commitment to support lower-income students in their aspirations to join the University of California,” said Richard Hughey, vice provost and dean of Undergraduate Education. “I am particularly proud that the Educational Partnership Center’s excellence in facilitating opportunities for students has again been recognized by the U.S. Department of Education. This funding will allow the Educational Partnership Center to serve 500 students from Lee Mathson Middle School in the Alum Rock Union Elementary School District; Bridges Academy in the Franklin-McKinley School District; and James Lick High School and Yerba Buena High School in the East Side Union High School District. Guided by current research, best practices, and a unified framework of academic preparation and a college readiness framework, the UC Santa Cruz Talent Search project will offer services in response to the demographic, socioeconomic, and educational needs of students and families in this high-need region. The project will provide students with an array of services, including academic tutoring, financial aid and scholarship application assistance, and postsecondary options workshops. Lizbeth Leon, a first-generation student from San Jose’s Andrew Hill High School, credits a similar program—the California Student Opportunity and Access Program (Cal-SOAP)—with helping her get to UC Santa Cruz. The program, run by the campus Educational Partnership Center, offered information about essays for the college application and for scholarships. UC Santa Cruz has recently been recognized as a Hispanic Serving Institution, with 31 percent of undergraduates identifying as Hispanic or Latino backgrounds. The campus is also dedicated to students with financial need – 44 percent of undergraduates receive Pell grants, the federal government’s need-based program for low-income undergraduates. The Educational Partnership Center, a program of the UC Santa Cruz Division of Undergraduate Education, coordinates new and longstanding student academic preparation efforts of UC Santa Cruz with the goal of increasing access and opportunity to postsecondary education for underrepresented students across the Monterey Bay and Silicon Valley/San Jose regions. Through six vital programs (EAOP, MESA, COSMOS, Cal-SOAP, GEAR UP and the California Reading and Literature Project), and with support from federal and state funding, EPC provides an array of direct services which support students on the college-going pathway through tutoring, mentoring, academic planning and counseling, leadership training, test preparation, college awareness and enrichment, and teacher professional development.